Though I absolutely detest all those feel good slogans people post all over Instagram, I will concede that a little positive reinforcement can work wonders if you’re feeling a little bit crap, and let’s face it, all of us feel crap at some point. I have a not-so-secret desire to be really strong, very fast and kill it on all kinds of bikes, so having set the bar ever so high for myself, I can find it difficult not to give myself a really hard time when I’m feeling weak. I really enjoy challenging myself, whether that’s by riding with people who are way faster than me, racing extremely tough events or riding really technical trails on my mountain bike but the upshot of all that is that I can’t help but compare myself against others, and as my energy/speed/ability or mood fluctuates I find myself doing so unfavourably. Am I going to start cycling with slower people or riding easier trails so I feel faster, stronger or superior? Hell no! But what I have found can be helpful is answering that critical inner with a ready-made positive response that counters the stupid stuff it’s saying. So it effect, you’re defending yourself… against…. yourself! 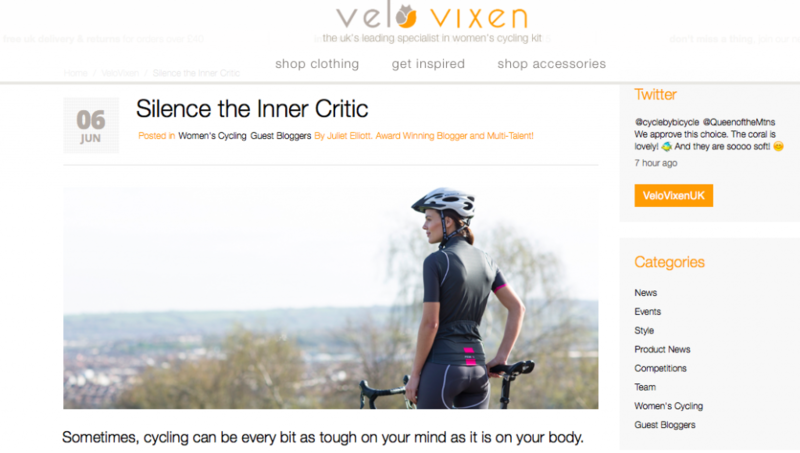 So if any of this resonates with you, don’t let your inner voice crush your confidence – check out my guest post on the Velovixen site and find out more about silencing that inner critic. Because riding bikes is fun, so don’t spoil it for yourself!